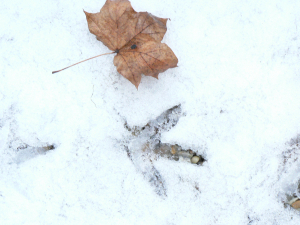 Observation - Moorhen prints in snow - UK and Ireland. Description: 3 toed prints about 9cm long, one in front of the other in a straight line made by the moorhens who take gleanings from under our bird feeders. Look similar to pheasant but a bit less delicate. 3 toed prints about 9cm long, one in front of the other in a straight line made by the moorhens who take gleanings from under our bird feeders. Look similar to pheasant but a bit less delicate.